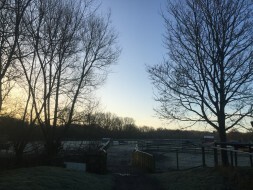 The other morning we woke up to a thin covering of frost. 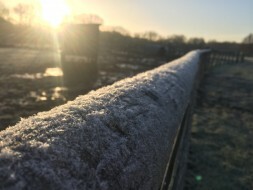 As cold as it was, it certainly made the farm look pretty (and the animals). Our morning was spent feeding our animals and breaking the ice in their water troughs. Plenty of corn and hay for everybody. 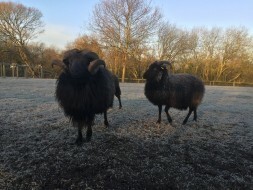 Our Hebridean sheep are a very hardy breed and are not bothered at all by the cold weather. 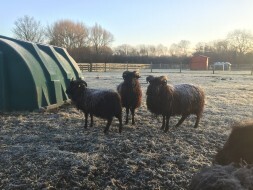 Hamlet, our ram, can be seen with his thick, woolly fleece, which keeps him warm throughout cold winters. 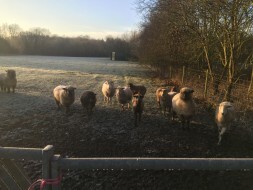 He is currently keeping our ewes company so we should see some lambs born around Easter time. 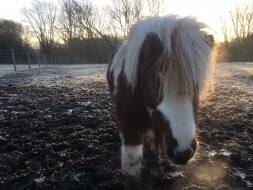 Another hardy animal on our farm is Cochise, our Shetland Pony. He is happy to live out all year round, his thick winter coat keeps him warm and dry. 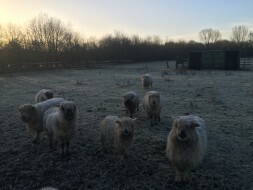 Most of our animals don’t really mind the cold weather as long they’re fed and watered. Happy animals!